It all started with one concept: a book about bikes + beer. 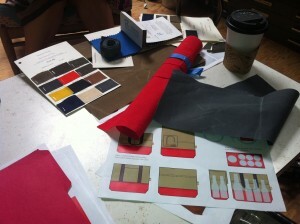 But it wasn’t long before a bounty of Hop in the Saddle-inspired ideas swirled under our helmets. One of my favorites? 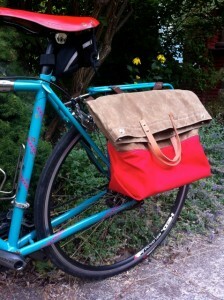 Our custom-designed Hop in the Saddle beer bag. In tandem with an ultimate Beer Bike, you could be sporting some serious style with this beer bag/pannier filled with a chilled 6-pack and 22-ouncer, U-lock, laptop, snackage and personal goods. 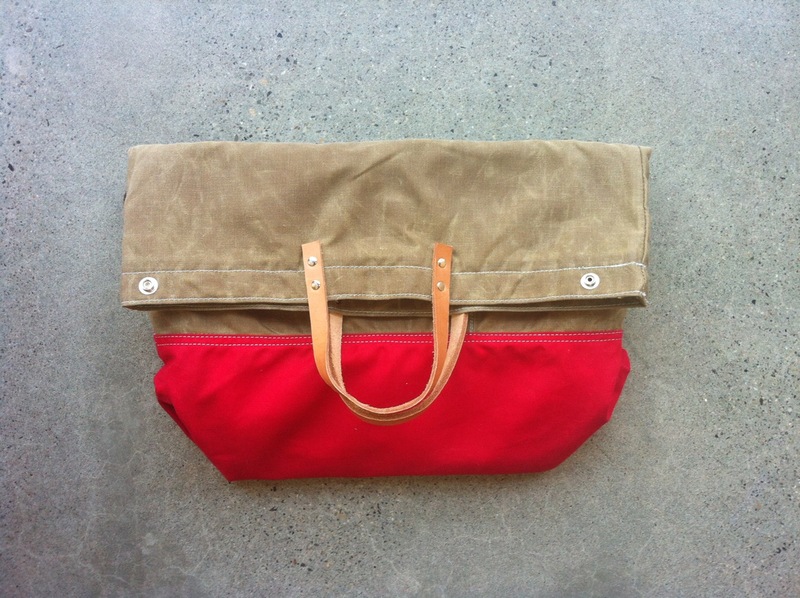 The bag is made of oiled canvas. Have you seen the stuff? It’s natural, durable (couldn’t believe how my 2-year-old’s paw prints wiped right off) and delightful to carry. The top of the bag folds over, giving you the flexibility to use it as a tall tote, handbag or around-town pannier. 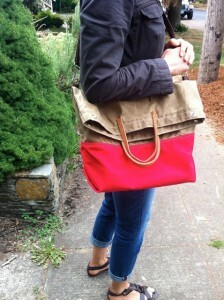 I love the flexibility of this bag, which will be my go-to hauler for my daily doings. The amazing woman who made this vision a reality is Portland’s own Rebecca Pearcy of Queen Bee Creations. I am inspired. It’s been a joy meeting in her buzzing hive-like studio where we witnessed her creativity in action. On top of the talent, she’s a delightful person. We couldn’t be more pleased with this partnership. People like Rebecca remind us why Portland is home. 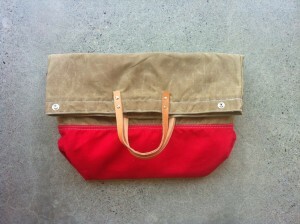 Here are some pictures of the prototype. We’re still working out the nuts and bolts, but we’re almost there. Behind the scenes inspiration at Queen Bee! Order one today by supporting Hop in the Saddle on Kickstarter at the $250 level. In addition to the custom pannier, you’ll get a heap of goods, including 2 copies of Hop in the Saddle (check that gift off the list), a copy of Cycling Sojourner, a knit beer koozie (another favorite I’ll be blogging about soon) and a super sweet hand-crafted bottle opener. That’s some serious schwag (total value exceeds $250!). Hop in the Saddle Launches! Let’s Celebrate Properly. Hop in the Saddle beer koozies have arrived!